Parents want to provide the best conditions for their child's visual development. For without good vision, a child may quietly lose an important tool to learn and grow. What that means is that a child may "fall behind" or have trouble staying on track due to undetected vision problems. It is possible that a teacher may think your child has a learning disability when the problem may be vision related. Our Pediatric Specialists, can detect subtle changes in a child's vision that could affect their academic or athletic performance. Because vision problems may begin at an early age, proper eye care is vital to learning and personal adjustment, vision develops and changes throughout childhood. A child's vision needs a variety of stimuli to develop properly. Good nutrition is important with a diet rich in fresh vegetables and fruits. A diet high in refined carbohydrates and sugars can create deficiencies that weaken the young developing eye. The visual world of a newborn is small and not fully formed. Your baby cannot see further than about eight inches, or the distance to your face. At birth, a baby grasps first with their hands, then follows with their eyes, as they begin to absorb visual information. Faces and brightly colored objects that move (such as mobiles) appeal to a baby's vision and are helpful in exercising the eyes. By three months of age, most babies can follow moving object until it stops moving. From three to six months of age, the retina of the baby's eye is well developed. This means the baby can see small details. Your child can see from near to far and is beginning to coordinate the eyes with the arm movement. By the time the baby is six months old, he/she focuses better on closer objects and has begun the process of developing binocular vision, using both eyes at once to understand and measure space. Distance vision and depth perception are still improving during these months. Your baby can only see objects two feet away. During this time, your baby's vision is approaching full development. Your child can see well beyond the reach of their hands. He/she focuses well on objects three feet away and notices objects up to 10 feet away. In a complex blending of your baby's vision and brain, he/she can now recognize the mother's face. The baby can scan an object; separate out the details in memory, and compare the shape with the image in memory, for example, the mother's face. Hand eye coordination can be enhanced at this stage by games that involve pointing, tossing, and catching. Your infant should be seen by an optometrist during this time. By the age of two, vision has become the child's primary tool of perception. It leads action with increased distance range as the brain and the eyes work in tandem. During the third year, children begin to associate words with their visual realm. By age three most children are eager to experiment with the visual world by drawing pictures. Expression through pictures and symbols help children integrate what they hear and see, and is very healthy. By 3 years of age, most children have the necessary behavioral and psychological development to allow subjective acuity testing. Four and five year olds can catch and throw a ball, and run smoothly using visual tools to coordinate their movements. During this time children require at least one complete eye exam to ensure that everything is developing smoothly. Protect your child's vision and future potential. Be sure to watch for possible signs that your child may have eye or vision problems. Early detection usually results in a resolution of the problem. Does your child have any of these symptoms? Blurred vision or double vision . Early detection and treatment of children's vision problems is critical. Once treated, your child has greater potential to succeed. Childhood eye conditions left untreated can be more difficult to correct. The good news is that our pediatric specialist can detect those eye problems during regular eye examinations. Myopia Control is the beginning of stopping nearsightedness in children, preventing their glasses from getting thicker every year, and ultimately ensuring healthy eyesight for their future. 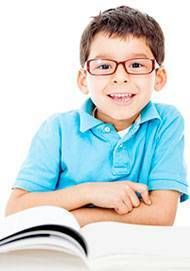 Click here to find out more about myopia control in children. Many thousands of children each year are treated in hospital emergency rooms for eye injuries. For young children, the most common causes of eye injuries are sharp toys, cigarettes, and household cleaning products. Older children may suffer serious eye injuries while participating in sports activities. The most frequent injuries to children occur during baseball, basketball, racquetball and other court sports. Wearing protective eyewear can prevent eye injuries. Call our office today, to set-up your child's eye exam.